Originally, Rich Guy, Vandelay and I were hoping to try out Hokkaido Ramen Santouka on Robson. However, when we did a drive-by (no, not that kind, the only guns we have are plastic ones), there was a lineup. You see, it was the official grand opening today and I suppose people were curious, similar to how there was a lineup at Chef Hung. Hey, I love ramen; but I'm not going to lineup for it! In need of food, we decided to try out the newish Guu Garden. While driving by the original Guu on Thurlow, we were presented with an ominous sign. There was quite a lineup. Was Guu Garden going to present us with a similar situation? I hate lineups and it serve s us right for trying to eat in downtown on a Friday night (albeit late). Never having been to the new Guu Garden, we weren't sure where the entrance was located. It's address indicates Nelson; but the actual entrance is a non-descript stairway located on Hornby halfway down the block. We were lucky to get a parking spot right across the street and proceed up to find that... there was no lineup! In fact, there was a nice table waiting for us! Now that is good luck for a change. Unlike the other locations, Guu Garden is not dark an d cramped. Rather, it is relatively spacious and well-lit. While looking through their menu, we noticed that it focused heavily on Oden and seafood. There was an obvious lack of meats. Thus, we ended up ordering a bunch of things we usually do not order while at Guu. 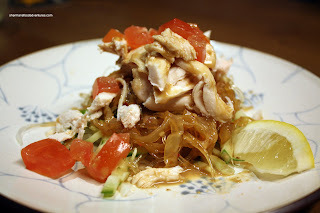 We started with something similar to the Jellyfish Salad offered at their Robson location. Rather than just jellyfish, this salad consisted of Jellyfish, Chicken and Cucumbers. Naturally, with addition of chicken and cucumbers, the salad had a meatiness and fresh crunchiness that the other version lacked. Something we had little knowledge of; yet decided to try was the Wasabi Mountain Potato. If my facts are right, this is not really a potato; rather, it is more like a yam which has the texture of a radish. I wasn't a huge fan of this personally. Other than the wasabi and vinegar marinade, the dish was a bit bland. I'm sure someone likes this; but I didn't. Next up was the Wasabi Marinated Octopus & Uni. The side of nori served as eating vessels. A bit sweet and with a nice contrast of textures, I liked this dish. Too bad it was a real chore to keep everything on the nori before we got it into our mou ths. Rich Guy picked something that was more "ordinary" in the form of Fried Chicken with Mayo. 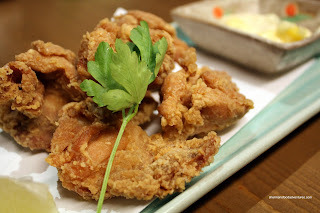 Resembling chicken karaage, this was exactly as described. Crispy fried chicken with the skin accompanied by a side of mayo. Since the specialty of Guu Garden is Oden and the fact it takes up a big portion of the menu, we decided to give a shot. 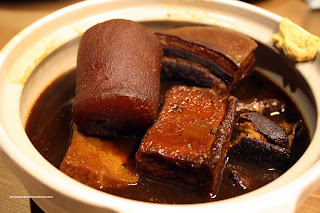 There are 2 types of Oden (Miso-oden and Kanto-daki) with specific items. 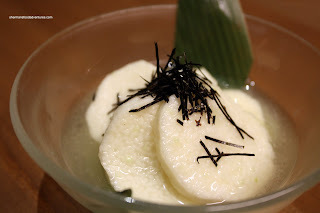 From that list, we picked out daikon, fried tofu, tamago and pork belly in a rich, slightly sweet Miso-oden. Not exactly that complex per se, everything was soft with the braising liquid completely penetrating each item. I particularly liked the pork belly (naturally!) since there was melt-in-your mouth fat and meat. Another one of Rich Guy's choices was the Tuna Tataki. He really never needs to vocalize his preferences since he always chooses raw meat and fish. Well, as expected, the tataki was well prepared and fresh. 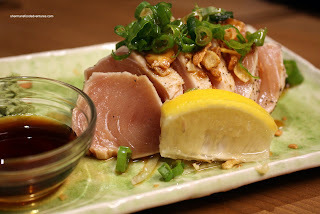 Served with onions, garlic chips, lemon and ponzu, the slices of tuna were sweet and had a nice texture (which was not mushy). Naturally, the last item that Rich Guy ordered was another raw fish dish being the Marinated Seared Black Cod Sashimi. 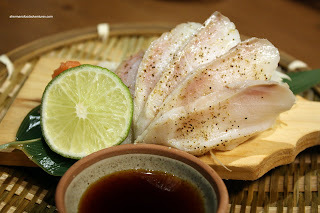 Due to its high fat content, we could really taste the "fish" flavour of the black cod. It could easily be mistakened for bad fish; but the texture was not mushy and still had a bit of "bite". I didn't mind it so much; but Rich Guy wasn't all that impressed. I guess this would be a case of personal preference. 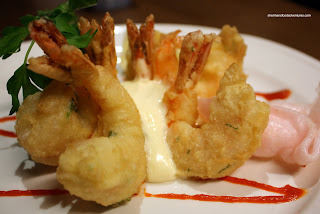 As with any Izakaya meal, I go for the Ebi Mayo. In addition to being fried perfectly, the shrimp had a nice crunch to them. I was happy to see streaks of sriracha on the plate with the big blob of mayo. This essentially created a chili mayo which I much prefer over plain mayo. Last dish to arrive was our "filler", as in the Yakiudon. Normally, Izakaya is not exactly the best way to get really full, unless you're ordering 3+ dishes for each person. After all, in Japan, it's not suppose to be an actual meal. The food is merely an accompaniment to the booze after work. But, we eat it as a meal here and a plate of carbs usually helps fill in the gaps of hunger in between small morsels of food. 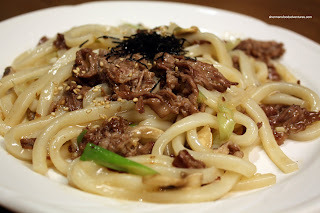 Therefore, we didn't expect much and I really have not much to say oth er than that the udon was nice and chewy with a smattering of flavour. 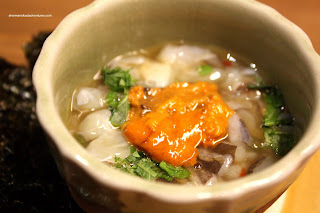 Moreover, it wasn't greasy or slimy (unlike the cod roe and mayo udon at Hapa). So once again, another solid meal at a location of Guu. Guu Garden is definitely a bit different in terms of the menu and the layout of the physical dining space. Not really a classic Guu experience; but enjoyable nonetheless. Well... I think it's personal preference. I've had it a few times and everytime, there is a distinct taste. I don't mind it too much; but some people don't. Well I'll just have to give it a shot at least once then!